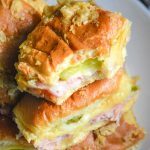 The perfect miniature sandwich, these yummy sliders feature the classic Cuban flavor combination in finger food form. Lightly spray a 9x13" baking dish with non stick cooking spray. Using a serrated knife, cut the rolls in half. Remove the top, set aside, and place the bottom of the rolls in the dish. Layer the meat, cheese, and pickles evenly out over top. Place the top of the rolls back on. In a small mixing bowl, whisk together the mustard and melted butter. Stir in the onion until evenly combined. Pour the mixture evenly out over the top of the sliders. Use the back of a spoon to spread it out slightly, if needed. Cover the dish tightly with aluminum foil, and bake at 325 degrees for 15 minutes. Remove the foil and continue baking for another 10 minutes, or until the buns are toasted and golden brown. Let the sliders rest for 2-3 minutes. Cut them, serve, and enjoy!